The year 2020 marks the 200th anniversary of the discovery of the Antarctic by the expedition led by Fabian Bellingshausen and Mikhail Lazarev. In honour of this event, plans are now underway to organise an around-the-world expedition of the tall ships Pallada, Sedov and Krusenstern in 2019-2020. 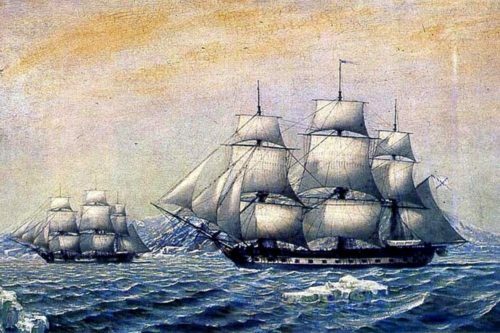 The south polar expedition consisting of two sloops-of-war, the Vostok, commanded by Fabian Bellingshausen, and the Mirny, commanded by Mikhail Lazarev, left Kronstadt in 1819 and discovered the Antarctic on 28 January 1820. In 1821, the ships returned to Kronstadt. They stayed at sea for 751 days and covered over 92,000 km. In addition to the Antarctic, the expedition discovered 29 islands and one coral reef. The Russian sailors conducted scientific research, including oceanographic research. The signed directive endorses an around-the-world expedition of the tall ships Pallada, Sedov and Krusenstern, which belong to the Federal Agency for Fishery, in honour of the 200th anniversary of the discovery of the Antarctic by the Bellingshausen-Lazarev expedition. The expedition is planned to start at the end of 2019 when the ships set sail from their respective ports: the Pallada from Vladivostok, the Sedov from Kronstadt and the Krusenstern from Kaliningrad. Thus, the expedition will consist of the Sedov and the Pallada sailing around the world and the Krusenstern taking a transatlantic voyage. Most of the places and ports the ships will call on were discovered by the Russians during their expeditions around the world. Milestone events during the expedition will be the meetings of the three ships in the Atlantic Ocean on the Ushuaia (Argentina)-Cape Town (South Africa) leg, in the area of the South Georgia and South Sandwich Islands (the UK), where the Pallada’s itinerary will reach its nearest point to the Antarctic.The Pallada’s voyage will start in Vladivostok in November 2019 and last until June 2020. The ship’s goal is to approach the Antarctic as close as possible. The Sedov’s voyage will start in Kronstadt in December 2019 and will be over in Kaliningrad in December 2020. This ship’s goal is to carry out a transatlantic passage to the appointed place and then sail together with the Pallada frigate, after which it will continue solo sailing. After the leg dedicated to the 200th anniversary of the discovery of the Antarctic (as far as the port of Cape Town in South Africa) the ship will start the second stage of the expedition dedicated to the 75th anniversary of victory in WWII. The Sedov will sail across the Indian and the Pacific Oceans. Reaching the Atlantic Ocean through the Panama Canal, it will continue sailing with the aim of visiting places associated with the most important events of WWII.The Krusenstern’s voyage will start in Kaliningrad in December 2019 and will come to an end in September 2020. The ship’s task is to carry out a transatlantic passage to the appointed meeting place and then sail together with the Pallada. It will continue alone to the Black Sea and call on the Russian ports of Sevastopol, Novorossiysk, Yalta and Sochi. After completing the first stage of the expedition and meeting with the other two tall ships near the island of South Georgia (the UK), the Krusenstern will continue its voyage dedicated to the 75th anniversary of victory in WWII, calling on the ports of hero-cities, cities of military glory and European ports with memorials to those who perished in the war against Nazism. Photo exhibitions dedicated to commemorative dates in Russian history will be arranged aboard the tall ships during the expedition. There will also be meetings with representatives of the foreign public and Russians living abroad.A special organising committee will oversee preparing for and carrying out of the expedition.